© 2012 by Jessica Richards; all rights reserved; content may not be copied, rewritten, or republished without authors written permission. The appliance that is used most frequently in most households is the washing machine, and Euronics offers a range of washing machines which come from a variety of manufacturers from Beko to Bosch. All washing machines have their own take on what they deem to be key marketing features, and the best brand is the one which includes all of the specifications that you need to make up the ideal machine for your needs. Before choosing a new appliance, it would make sense to sit down for a minute to consider the minimum set of enhanced functions you need your washing machine to provide to you. Do You Need Advanced Wash Features? Which features you need depends on what you use the machine for. If you run a basic wash ninety-five percent of the time then you dont need fifteen extra wash settings. But for anyone who washes a variety of things, from school uniforms to office wear, towels, bedding, delicate items, and more, it might be worth considering a washer that offers all the wash cycles that you need. Many machines even include a hand wash function for the more delicate items which eliminates the need to wash some garments at the sink. Spin speed is important, particularly if you do a lot of washing. 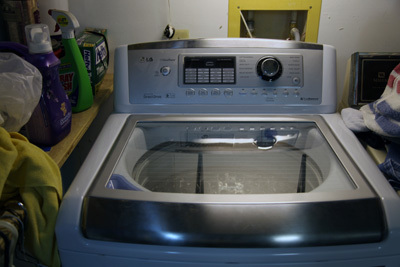 The spin speed defines how dry washed items are when they come out of the machine. Something that will be line dried throughout the day would be fine with a low spin speed. However, if you have a lot of washing to get dry or use a tumble drier, you dont want dripping clothes coming out of the washing machine. In other words, a very fast spin extracts more moisture and allows your clothes drier to be much more green and frugal by minimizing electricity or natural gas consumption. The other side of the spin speed coin is that having a selection of spin speeds makes it easier to wash the more delicate and easily creased items. If you live alone and only do a few wash loads a week, a 9kg wash size might be considered overkill when a 3kg one does the job just as well. There are times when paying for overkill just doesnt make sense. For a family with a large amount of bedding, towels, school wear, home wear, and more to get washed each day, a larger load size is a must. Its worth considering the size of your tumble drier in comparison to your washing machine too. Washing 9kg at a time is great but not if your tumble drier only holds 6kg. Energy ratings are important, not only because of the impact a better rated washing machine has on the environment but also because a washing machine with a more energy efficient rating will cost you less on your energy bill. This is another point to consider when choosing which brand is best for you. Paying a little more for an Energy Star rated appliance like the LG WT5001CW high efficiency large capacity washer pictured at the top of this article pays off in the long run. One of the most important points to consider when buying a new washing machine is your budget. Euronics offers a wide range of appliances to suit everyone which makes the choice much easier. Also, keep in mind that in todays competitive market, it is easier than ever to secure a favorable credit rate if you dont want to pay the full cash price up front.